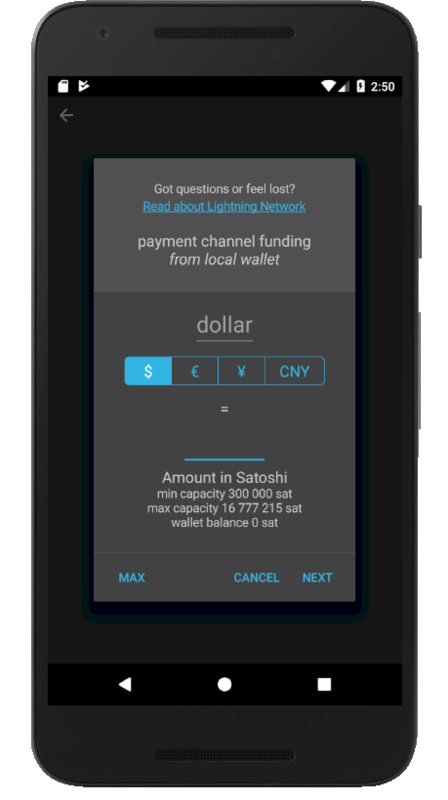 Instructions on setting up a Lightning Network-enabled Bitcoin wallet that can be used on Microlancer.io. A word of caution: these instructions are for beginners who wish to get started quickly. As you get more comfortable or have more funds at risk, you should run a higher security full node instead of a lightweight wallet. There are many other wallets you should try - and this is just a suggested quick setup for total beginners. 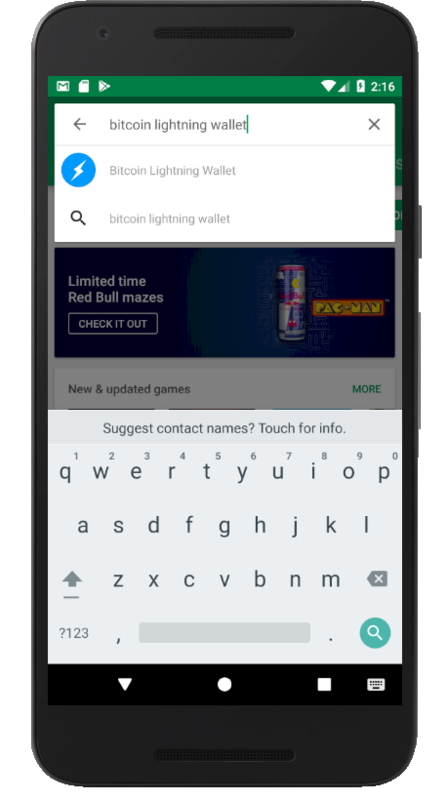 Search for the "bitcoin lightning wallet" on Google Play. 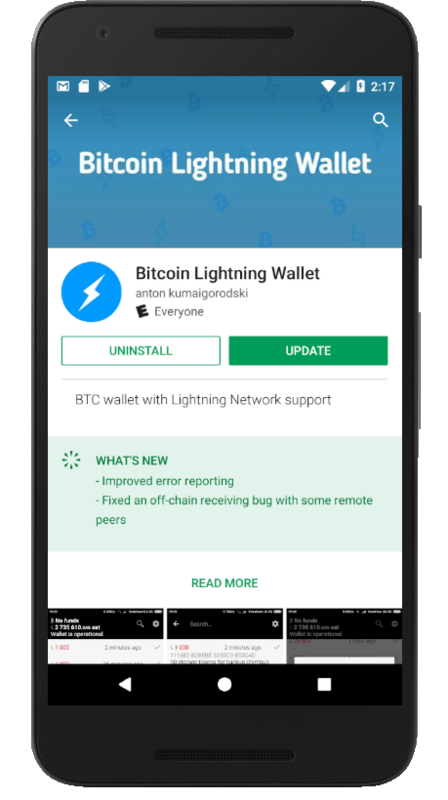 You should see a suggestion for Bitcoin Lightning Wallet with a blue circle and a white lightning bolt logo. Verify it is the app created by anton kumaigorodski and install the app. Run the app after it's been installed. When the app loads, it will ask you to save your mnemonic phrase. This is a special password that can help recover your wallet in case you lose it. Write down this phrase and keep it in a safe place. Tap the orange Bitcoin icon on the bottom-right corner of the app. A menu should appear. Choose "Receive funds". 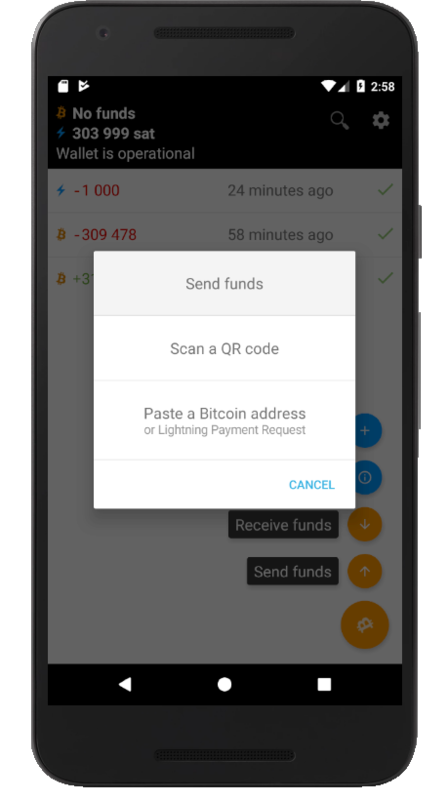 On the Receive Funds screen, choose "Bitcoin transaction". You should see a QR code appear. Deposit at least 0.03 BTC (~$20.00 USD as of this writing) to this address. You will need this much as a minimum requirement in order to open a Lightning Network channel. You will be able to close the channel and withdraw your BTC in the future when you need it back. You will then need to wait 10 minutes to an hour for the Bitcoin transaction to confirm. Yes, this takes a while, which is why Bitcoin Lightning Network exists! 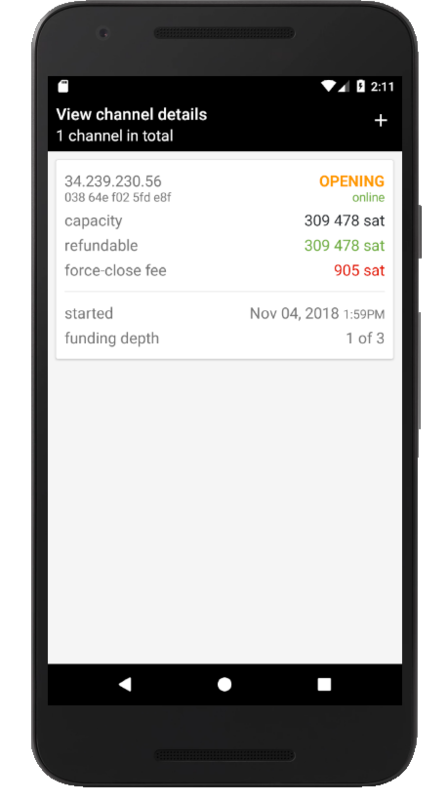 All of your Lightning Network transactions will be instant and quick, after you've opened a funding channel. On the app home screen, click the orange Bitcoin icon again, and choose "Open new channel". Then select the "Recommended ACINQ node". You should use this node for now, because it supports receiving Lightning Network payments. In the future, more nodes will have this capability. Select "MAX" as the amount for the channel, which should be the 300,000 sat you deposited into your wallet. Then hit "NEXT". You will see your channel being opened in progress. 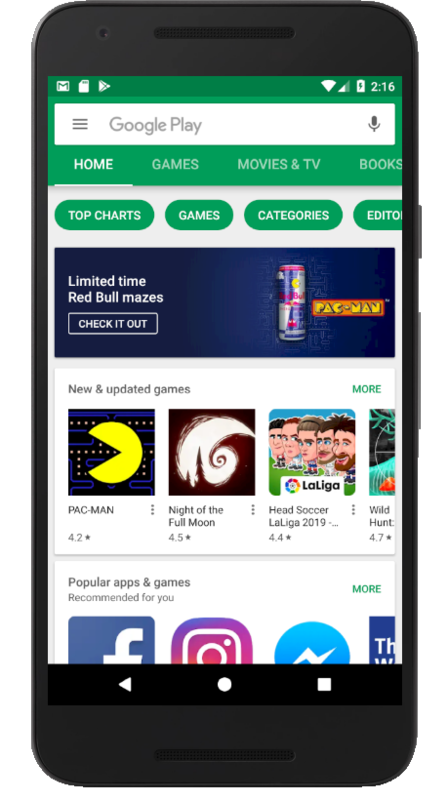 Once your channel is established, you're ready to use your wallet! 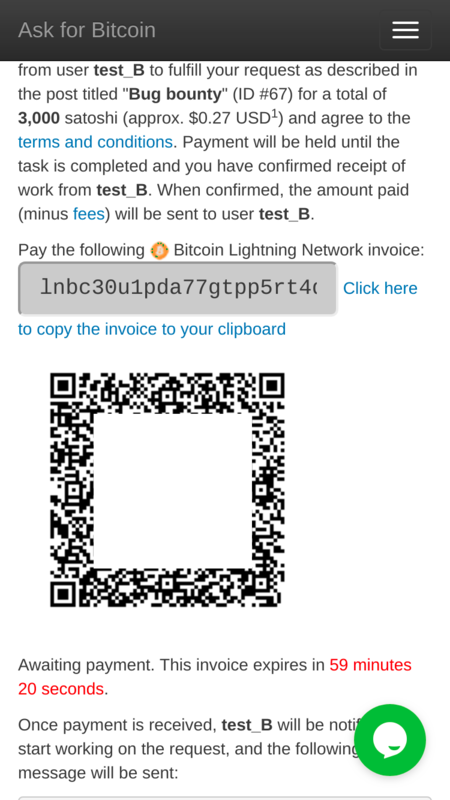 When you're ready to make a Bitcoin payment via LN, you should scan the LN QR code that appears on the payment screen. Here is an example of the payment screen on Microlancer.io. 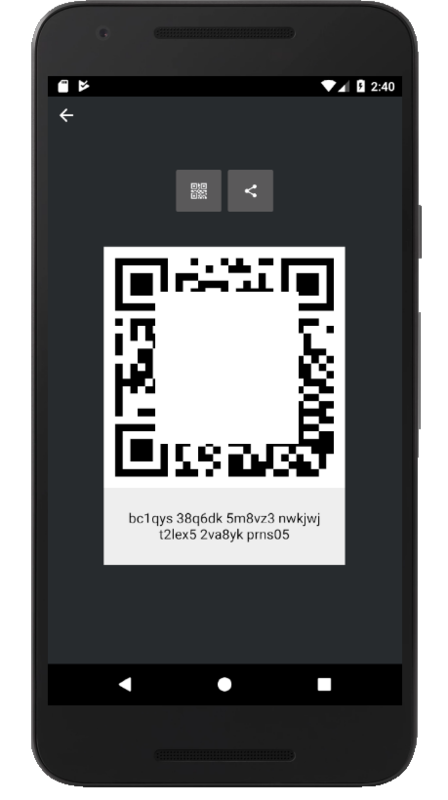 Click "Send funds" from the wallet menu, and then select "Scan a QR code". Once the payment is complete, the task should appear paid on the website! To receive a payment, go to the Microlancer.io withdrawal page under My account. 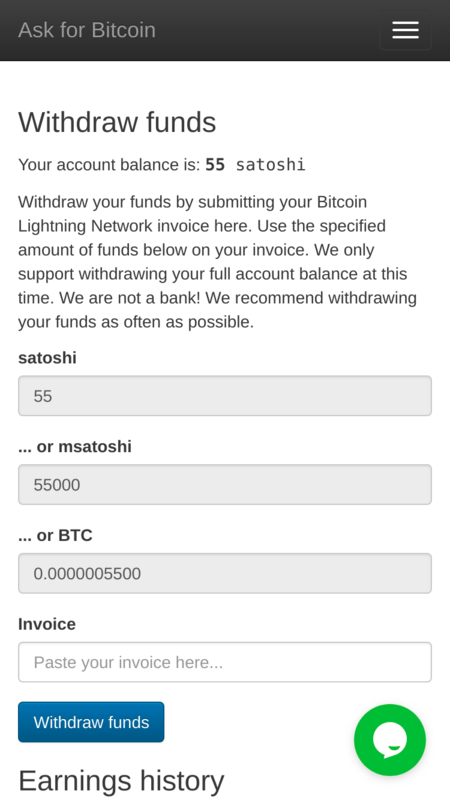 Next, on your wallet, click "Receive funds" and then choose "Lightning payment". To convert the barcode on your phone to the invoice text, you can use the webcam on your computer to scan the phone. Go to https://www.the-qrcode-generator.com/scan to scan your phone from your computer. It might not detect the code right away, so be sure your phone is close enough to the camera to nearly fill the whole screen. Copy the invoice text into the invoice field. Be sure it starts with "lnbc" and copy the whole string, it is very long! Then click the "Withdraw funds" button. Your funds should appear in your wallet! To withdraw your funds back into on-chain Bitcoin, you will first need to close your channels. 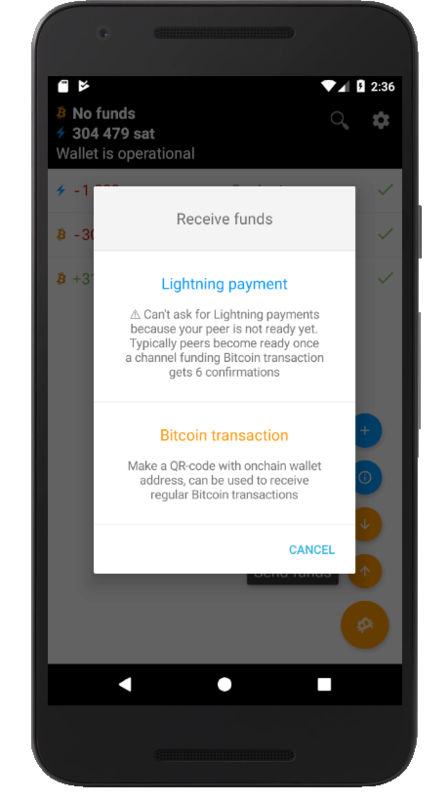 Only do this if you are sure you don't want to pay or receive any Lightning payments anymore, or you need on-chain Bitcoin for some purpose. First, copy a Bitcoin address into your phone's clipboard. Then in the wallet, choose "View channel details" and tap anywhere on the channel. Then, select "Close to specified address" if you have an address copied to your clipboard. Otherwise, choose "Close to this wallet". You can then send the funds to a Bitcoin address from the "Send funds" menu later.